There are certain things we can learn from our mistakes. That holds good for life in general. But, here I am talking about learning from cooking disasters. Most stories of kitchen disasters doesn't see the light of the day. Dishes than doesn't turn out as expected often finds it way to the dustbin and the memories of an unpleasant experience is shoved to the back of our mind. But, sometimes we learn certain things by mistake. Here I am talking about churning butter from cream. Quite a while back, one of my friends had asked to give her a hand in baking and decorating a cake. That was the time, I was a new bee in cooking and had found my new love for baking. I agreed and we set out to bake a nice, gorgeous cake. But that was not the case to be. Something went wrong! Still, we did manage to salvage our cake and produce something presentable. The thing that had gone wrong was with the cream icing. While whipping the cream, we realized that it had curdled a bit. Now I know that it was over whipped and the butter and the whey had started to separate. But, back then I wasn't sure. Recently, DH said he felt like having fresh homemade white butter on cream cracker biscuits. It had been ages since he had those and I was wondering what brought them to his memory. The thought of making butter at home was constantly there in my mind for a while. I have seen my mom make ghee. For that she collects thick cream from the top of homemade yogurt patiently, over a number of days and when she has a good amount of it, she churns butter out of it which is then used for making ghee. All these made me think of my icing disaster and I googled about 'making butter from cream' and landed on this WikiHow page. Confidently I decided to try it on my own and you can see what I got. A hand whisk or an electrical one. I used electrical one as one has to whisk a lot. 1. In a cold container pour the cream and start whisking. The cream will go change texture as you continue whipping. Don't stop even when you get the soft peak consistency and continue whipping. 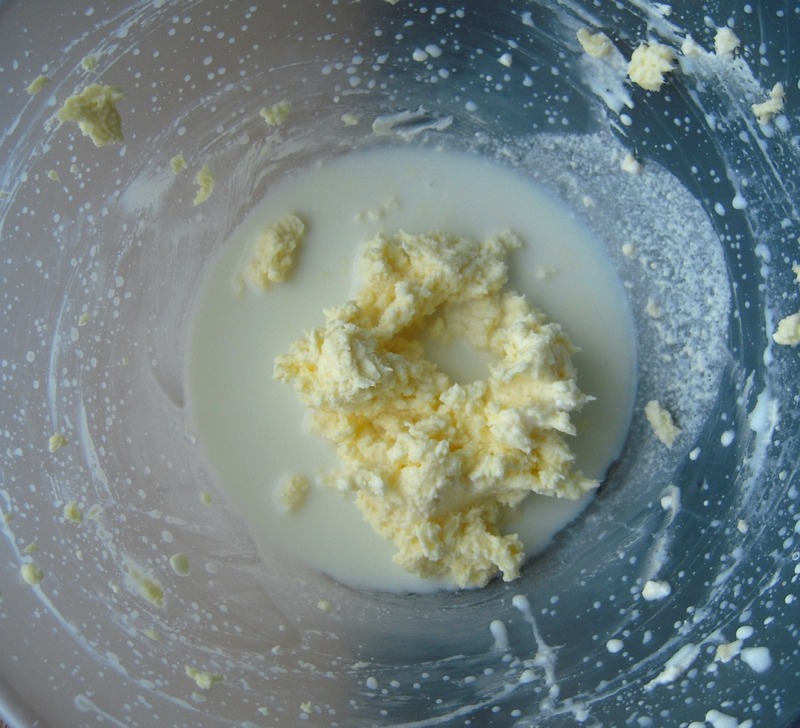 At some point in next 5 minutes the cream will start curdling and chunks of butter will start floating in whey and soon your mixture will look something like this. 2. Separate the butter from the whey. Add ice cubes to the whey so that any remaining butter solidifies. Once you have collected all the butter, make sure there is no buttermilk left in it. Wash it with cold water as stated here until you get clear water. Save all the butter and shape it. Store it in an airtight container. 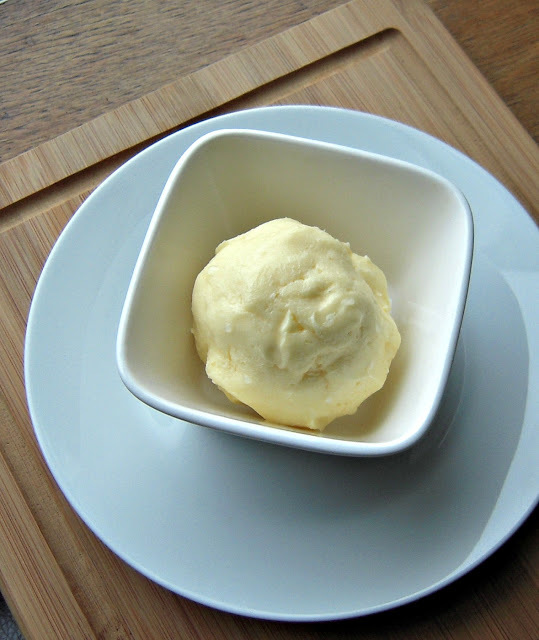 I got about 120 gm butter from 250 ml of double cream. 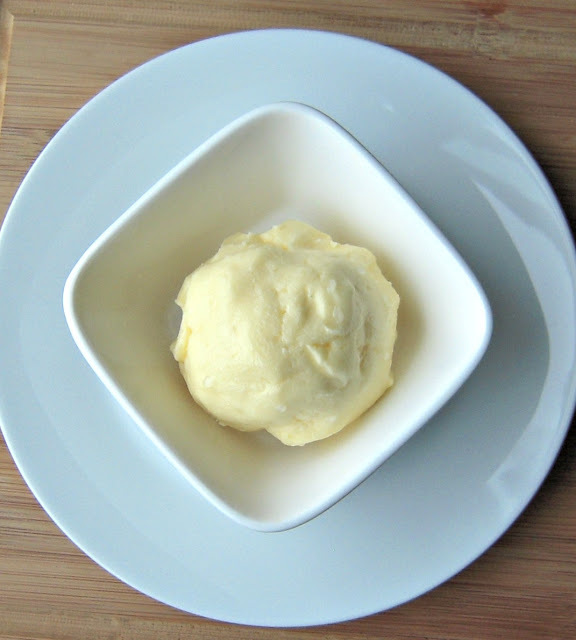 Enjoy homemade butter on toast, on cream cracker biscuits, in soups etc. I also made Makhanya Lassi with it. I will share it next here. Creamy, luscious butter!!! nicely explained..